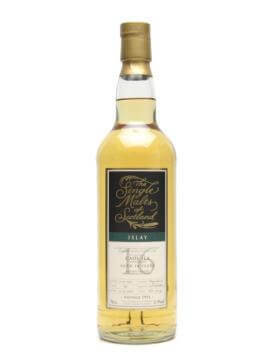 In 2006, Caol Ila joined the extended Classic Malts range from Diageo and we consumers got a extended line totalling SIX (6) official bottlings from the distillery, including a Distiller's Edition (finished in dark moscatel casks) and an 8yo 'unpeated' expression(note: this does NOT mean it is not peaty). The normal phenol level (peatiness, measured in parts per million) is 12-14ppm. For context, Ardbeg is about 24-26ppm and Glenmorangie about 2ppm. Today all of Caol Ila's spirit is tankered off Islay and filled to cask at Blackgrange(Cambus) or Menstrie(Carsebridge) on the mainland where it will mature. Where did this puppy mature? For all SMS bottlings had on the mission, click HERE. For all Caol Ilas, click HERE. Luscious, weighty nose, full of toffee sweetness, citrus, wet hay and freshly dry cleaned shirts. Smoker's fingers, scotch broth, and Chinatown at night (vinegar and white pepper, roast pork, fresh fish, and cleaning products). With water there is a bubblegum sweetness, almost spearminty, and more scented all-purpose cleaners. Viscous in the mouth (scotch broth again? ), pleasantly oily, with absolutely enormous peat and smoke. Nutty and fruity, maybe macadamia and papaya, with the starchy sweetness of fresh cut potatoes. With water there are cashews, credit card plastic, and an earthy peatiness. Slightly drying with smoke and more smoke through the finish. Minutes later I can still taste it and there are coastal elements of sea salt, peat, wet stone, and fish. Well, good morning, sunshine. Pow! Big, oily, smoky whisky with sweetness and other characteristics to work their magic as well. Water can be used like an EQ with this whisky, adjusting the different frequencies: bringing the sea closer, making the lemon more pronounced, drawing out the sweetness, etc. Islay lovers will find much to enjoy here and peat freaks will relish this stuff straight out of the bottle. Impressive stuff that doesn't mess about.